Please note that the monthly payments calculated with our Lease Calculator may change without notice and are before sales tax. 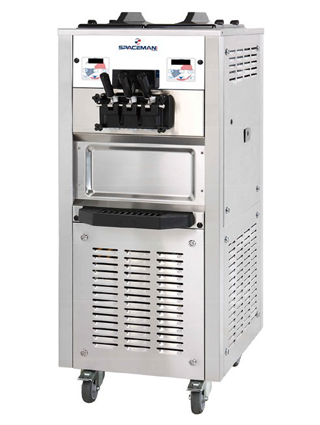 Mid Capacity, Twin Twist Floor Standing Soft Serve Machine is Ideal for Ice Cream, Custard, Frozen Yogurt, Gelato, and Sorbet! 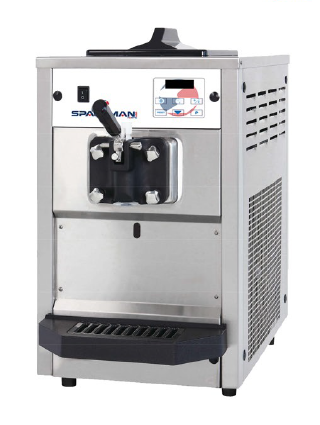 Single Flavor, Low Capacity Counter Top Soft Serve Machine is Ideal for Ice Cream, Custard, Frozen Yogurt, Gelato, and Sorbet! Ideal for Frozen Beverages, Slush Beverages, Margaritas, Smoothies, Shakes and Frozen Coffee Drinks! Three Flavor, Two Twist, High Capacity Counter Top Soft Serve Machine is Ideal for Ice Cream, Custard, Frozen Yogurt, Gelato, and Sorbet! We are there for you and we stand behind our machines! 7 days a week, 8am-5pm MST, unlimited phone support and training 7 days a week. The service lines goes directly to trained specialist by Spaceman. 24 hour average response time if we can't fix it on the phone. Something needs to be fixed (1 year parts and labor). 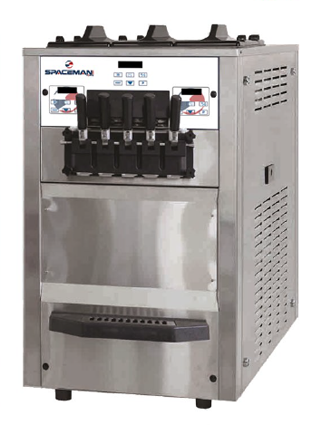 I purchased two frozen beverage machines from Spaceman USA for my two delivery restaurants and I couldn't be happier. One machine was new and the other was refurbished. Both machines have ran flawlessly since install, and the product consistency is perfect. These machines lack in huge price tags but do not lack in the quality department. These are great machines that are built to last. Even better than their machines though, is their customer service. This is the best company I've ever had the pleasure of working with. They make sure you have everything you need every step of the way, and they do it quickly with a smile. Spaceman USA is not only the future of ice cream but the future of Fat Shack as well. We have used Taylor and Stoelting in the past as well as other brands not worth the mention. 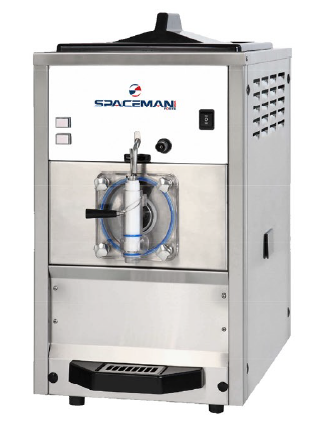 The spaceman 6250 is a outstanding machine - great function, excellent product produced, and the cleaning is easier then Stoelting F231. The blades last longer then the Taylor machines we have used and the service and parts contacts are the best and friendliest we have encountered. Wow, I cannot say enough about your company!! We are so pleased with everything, from the start to finish thats its hard to put into words. I will start with the machines...Its amazing how quickly they make yogurt, the quality and consistency is perfect. They are easy to put together, and disassemble to clean. I've worked with Taylor machines, and trust me, these are alot easier. Brand new machines, affordable price, and quality service, it doesnt get better than that. The personal training was great, and it was fun!! 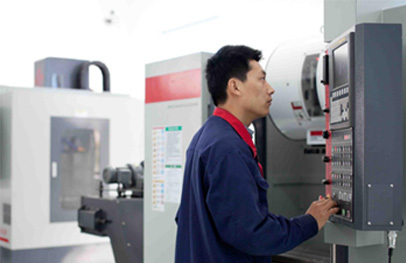 Now we have the understanding to make our machines run smoothly, and effectively for years. I want you to know that your customer service catered to our every need. They responded quickly to our questions, and sent so many helpful resources. Anytime they were ready to help, and with such a gracious manner. Five stars, to your employees!! It really helps when opening up a store to have the confidence in a company that cares that their clients succeed. Hands down, for quality, price, and customer service you are the best!!! Happy holiday to all of you!! Good Evening Tyler and Jeff! I wanted to take a moment and let you know how great of a job Kevin did during his trip to Gettysburg. I was anticipating his visit and to have our machines full functioning at 100%. With his help today we were dispensing a great product! He went over in great detail why the machines work the way they do and the best practices to have them run efficiently. Aside from functionality he also took time to go over best practices in the industry which I know was not necessary.. but it was greatly appreciated! I can understand why he must be such a great asset to your Spaceman team. 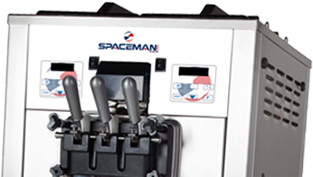 "We are ranking the Spaceman 6250 as the Best Soft Serve Machines for the frozen yogurt and mid sized soft serve ice cream business."